Summary: One of the best Wake up Light Alarm clocks on the market, a stunning design by Philips and everything you want, reading light function, built in FM radio and a sunset feature to help you go to sleep while being bright and relaxing when waking you up in the morning. 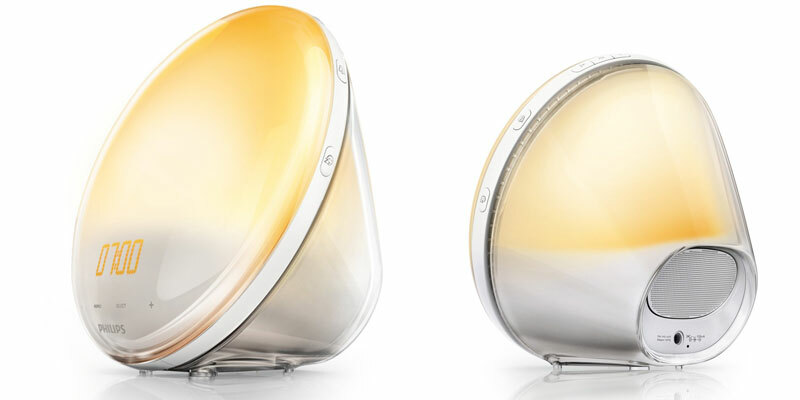 The Philips Wake-Up Light Alarm Clock HF3520 is the top spec model in the Philips range of wake up light simulation clocks. In total they have 4 model and this comes top with everything you need and more. Being the top model in the Philips range it has everything you need and little more, it comes with 20 adjustable brightness settings, a 300 lux LED light, a choice of 5 wake-up sounds, or the use of the FM radio that is built in, and the ability to have 2 alarms set, unlike all the others where you can only set one. The clock screen on the front of the light automatically dims and adjusts to the brightness on the room, so if it is dark it will dim down, although you cannot turn this off completely. As well as these features it also includes the standard snooze function which will give you an extra 9 minutes in bed by tapping anywhere on the device. 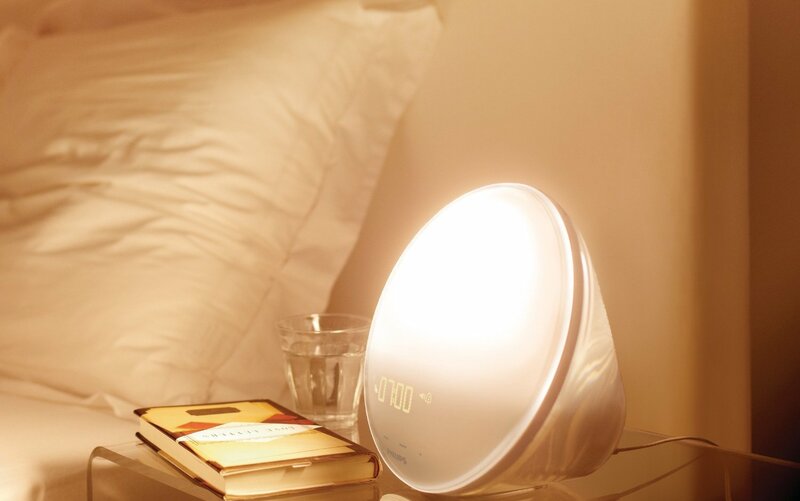 You can set the sunrise simulation duration to be between 20 and 40 minutes, and it can also be used as a reading lamp where you can also adjust the brightness up and down to what you require and feels comfortable. 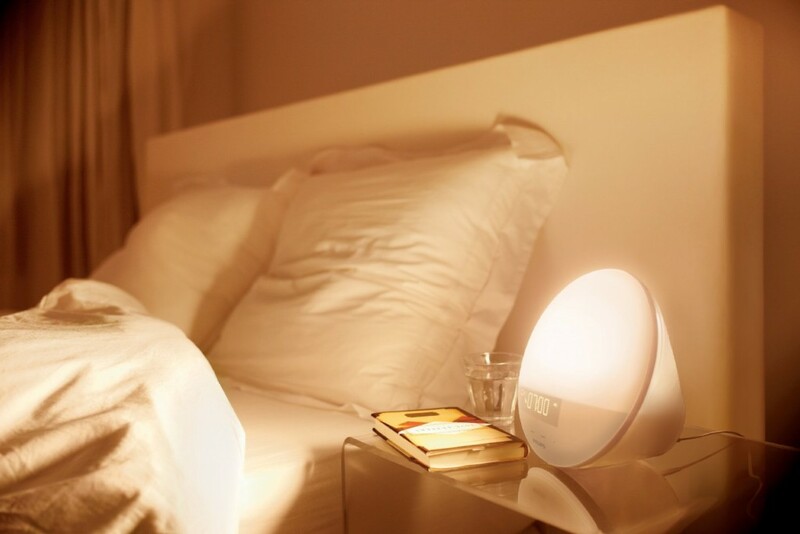 While it is designed to wake you up it also has a sunset feature helping you dose off in the evening too. It will slower dim down and go into darkness over a set duration that you can adjust, if you have the radio on using the light it will also slower get quieter as the light dims before it all goes off. This is great for relaxin in bed and helps you to fall asleep. Like the model below this is follows the same design, a beautifully designed sleek looking device, it reminds me of a light bulb on its side, or a speaker cone. 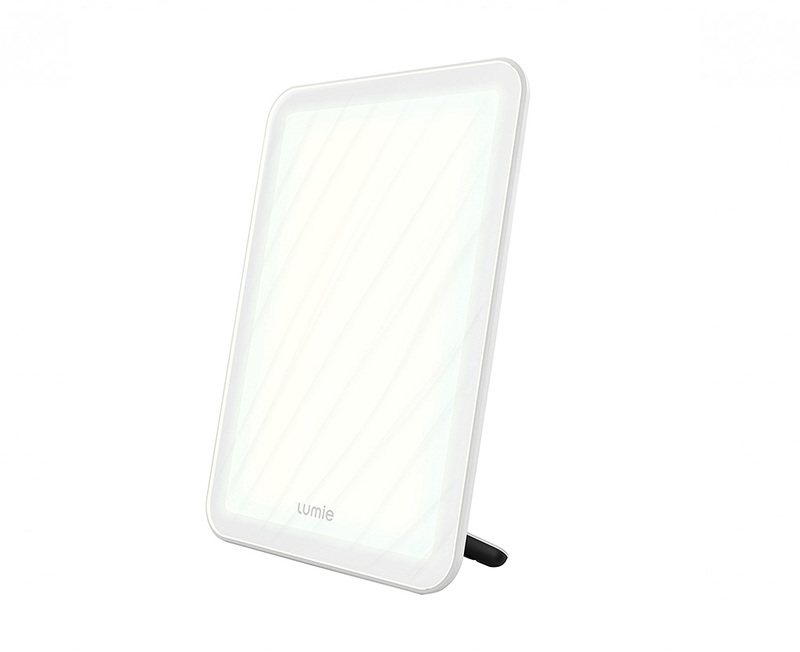 It is a stylish looking light and doesn’t take up to much space on your bedside table. 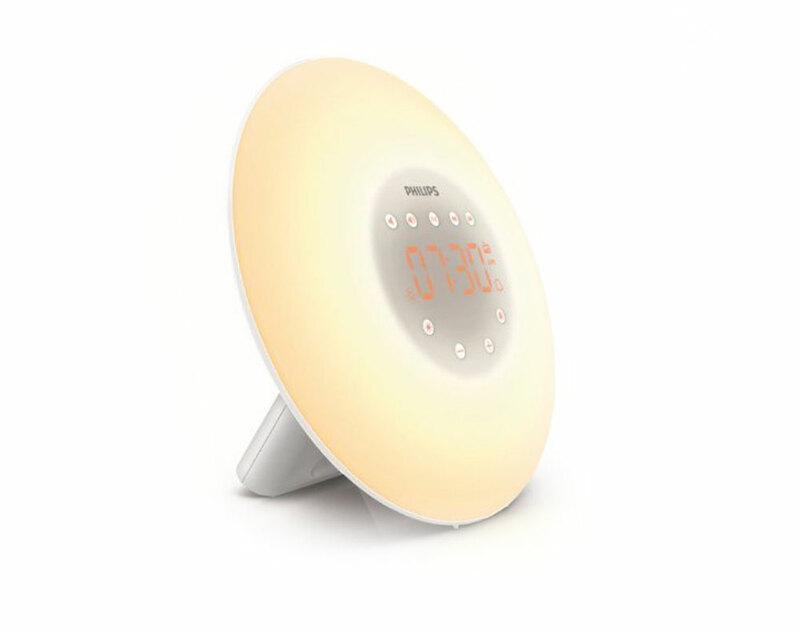 The Philips HF3520 Wake up Light Coloured Sunrise Simulation lamp has all the buttons around the edge of the light going across the top, some of the buttons are grouped together for the radio and adjusting the brightness, while the rest are spread out around the side. To the back is the speaker for the radio and alarm sounds, and a socket for the power lead. Depending what time you set the sunrise to start the light will start to glow dimly in a very deep reddy orange colour, simulating the sunrise, it will then slowly go orange, before slowly turning to daylight and its brightest white colour, and if you set one of the sounds then the birds will start to sing too. The nature sounds are very relaxing and a nice way to wake up. You can set this to happen over a 20 minute up to a 40 minute period, if you set the alarm to go off at 6.30am, and set if to light up over 30 minutes, then the light shall start working at 6am starting with the reddy orange colour. 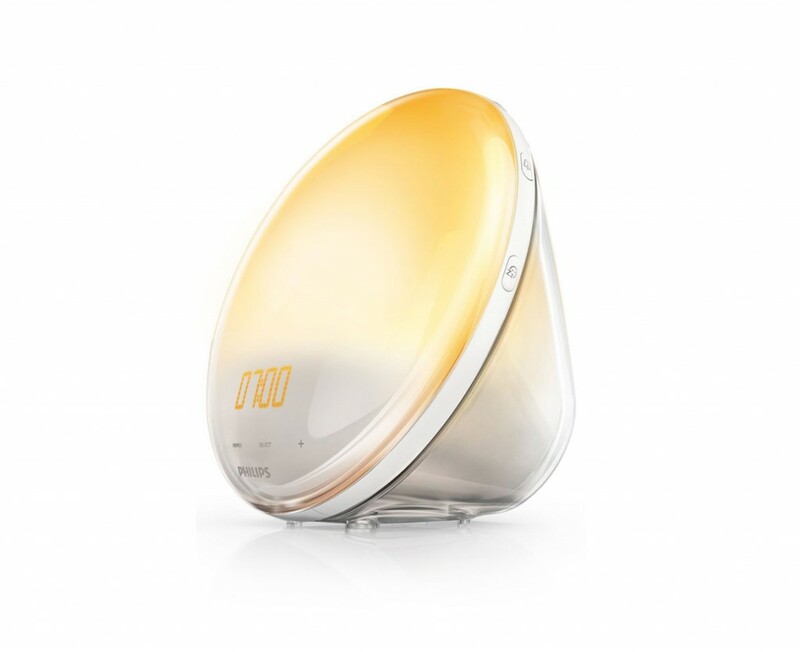 The Philips Wake-Up Light Alarm Clock HF3520 comes with lots of great features and is still easy and simple to use. The instructions that come with this are clear and easy to follow. The buttons on the unit itself are a little small and can be fiddly to press, but once you have got the hang of what you need to be pressing and know which is which button it is straight forward. It Works – After a weeks or so use you will certainly feel the benefit and notice a difference in how you wake up. FM Radio – Wake up to your favourite radio station or some relaxing nature sounds. Looks Great – If aesthetics are important then this will look great on any bedside table. Easy to use – Simple and easy to use as well as set up. Sunset – Helps you get to sleep with the sunset feature. At the time of writing this there have been over 170 reviews on Amazon UK and a overall star rating of 4.5. 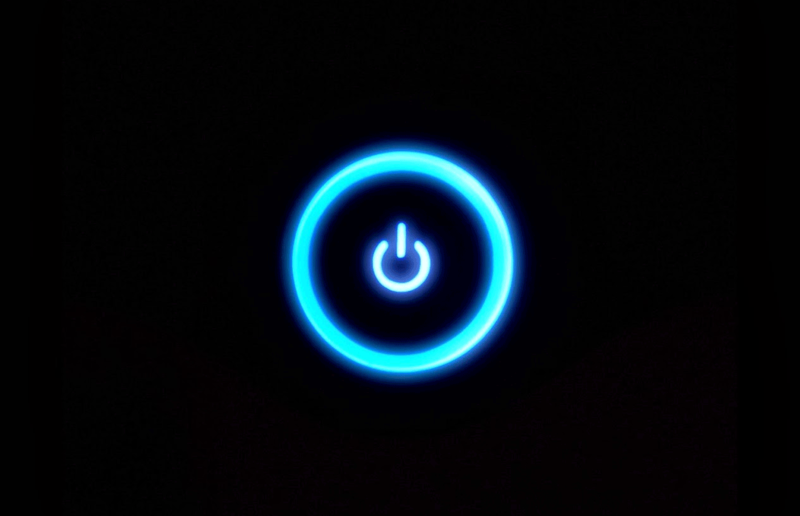 A common mention is the time display, when it is complete dark the time can still be seen and although it is dimmed then orange time display is still quite bright in the dark room. If you want the time to e displayed then this shouldn’t be an issue, however if you want it to go off completely then you would need to stick something over it. The table below shows how this model compares in terms of feature to other models from Philips. After a weeks or so use you will certainly feel the benefit and notice a difference in how you wake up. The light really does work and really does help. It not only looks stylish and modern, it is simple to use, and really does the job. 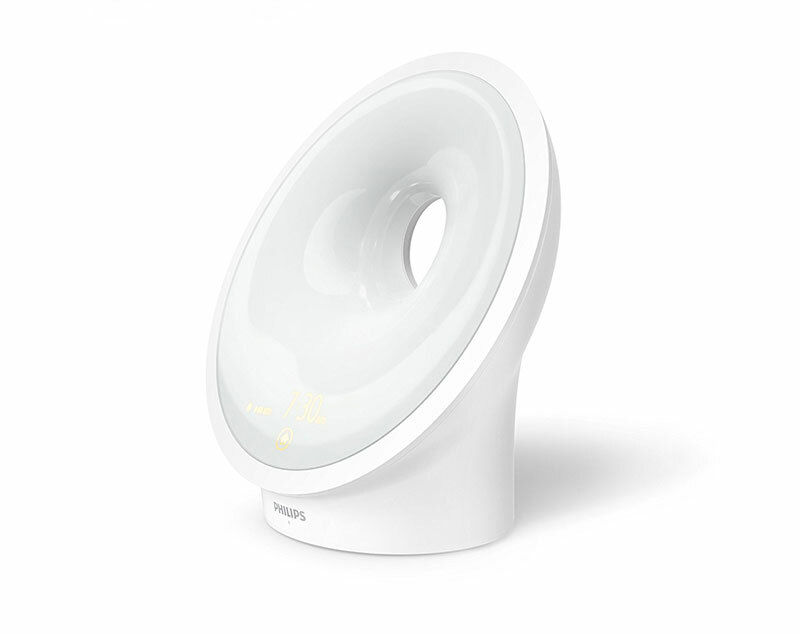 It create a very warm light that gradually gets brighter and brighter unlike cheaper alternatives that are more sudden. 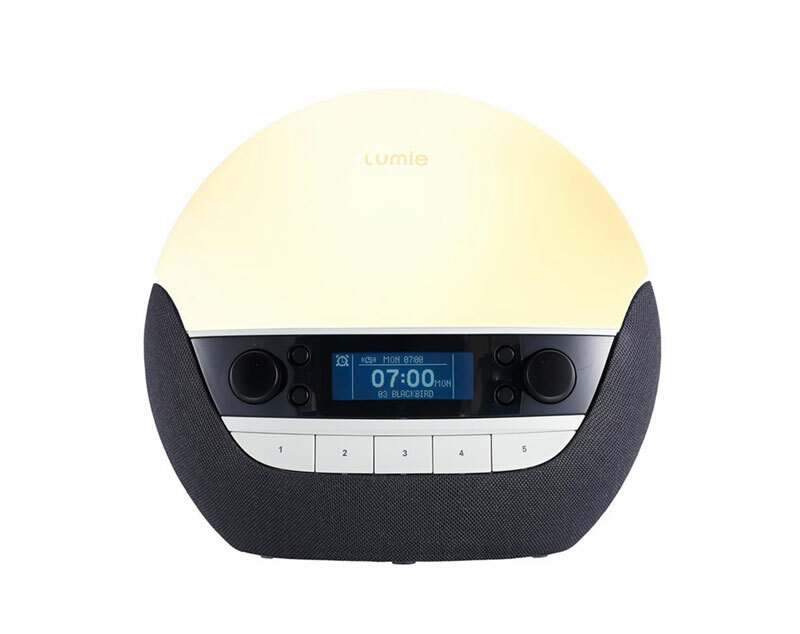 Being the top model it has everything you need, just love the style and design of it and it has some one great features, the built in radio is useful, the brightness it goes to is great for deep sleepers who require that extra brightness to help wake us up. At the time of writing the Philips Wake-Up Light Alarm Clock HF3520 has over 160 reviews on Amazon UK and a 4.5 star rating, so it is certainly a very well recommended wake up light. The FM radio allows you to wake up to your favourite station, or you can select a relaxing nature sound and wake up to the sounds of birds, bliss. Priced at £130 it isn’t cheap, but then you do get a very well built and very stylish bedside light and alarm clock. A product that could have been designed by Apple it does look and works great. I certainly recommend this and give it top marks for function and design! 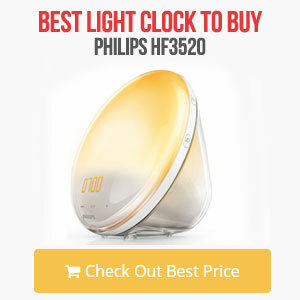 Check out the Best Price for the Philips Wake-Up Light Alarm Clock HF3520 here. Great review, thanks for that. I know this model has an adaptive light function on the clock, but are you able to turn it off completely at night? If not is the clock distracting/too bright at night? Hi Nicholas, you can adjust the brightness of the display, it cannot be turned off completely and on it’s lowest/dimmest setting it isn’t too bright, however in pitch black it obviously stands out but isn’t an issue.